← Hengao, Pon Pon Pon Lyrics, and a Chance to Meet Kyary Pamyu Pamyu! Hey guys! Sorry I haven’t gotten a chance to post much this week–I’ve been in Tokyo, helping out with the Orientation for new JET Programme participants. Almost 700 newcomers arrived from around the world, and that many more are coming again this weekend. It was a crazy few days, but great fun. 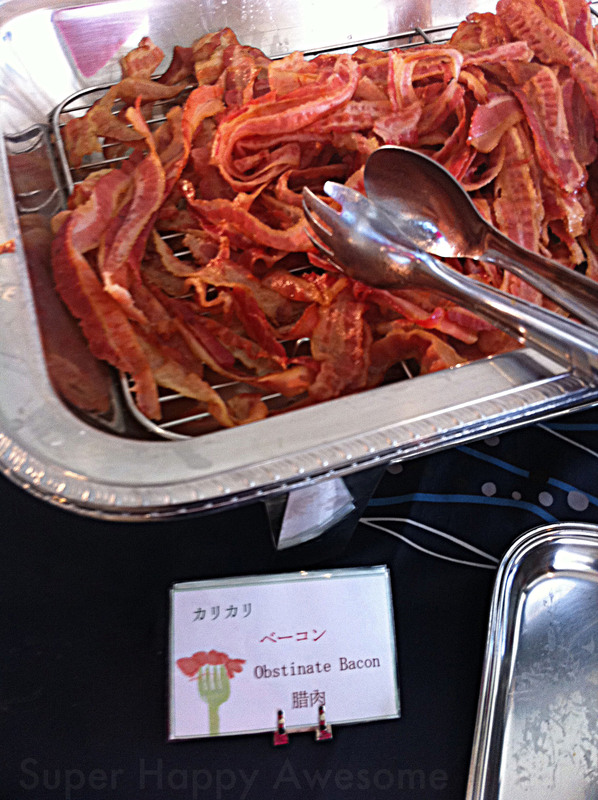 Sunday we spent the day out at Narita Airport welcoming all the new arrivals, and this was on offer at the breakfast buffet at our hotel. I’m not really sure what obstinate bacon is, really. Inflexible, difficult to change…is that a weird way of translating crispy? This bacon is so set in its ways, you guys. Don’t even try to change its mind. What do you think? Either way, it tasted delicious! This entry was posted in Engrish. Bookmark the permalink. 2 Responses to Engrish of the Week! I don’t know but I like it.